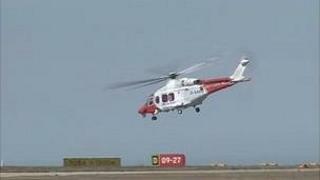 The search for wreckage of a private plane which crashed off the coast of Jersey is continuing. Derby businessman Carl Whiteley, 56, and his wife Kathryn have been named as the two people on board who died in the crash on Wednesday. Stephen Driscoll, the operations director for the Port of Jersey, said small bits of wreckage have been recovered and taken to Jersey. He said sonar would be used to search for wreckage which may have sunk. Mr Driscoll said recovering any wreckage could be difficult as the area is at least 40m (131ft) deep. He said: "It looks as though it was a high velocity impact so there's probably not much left of the aircraft." He said what had happened to the bodies was "unknown at the moment". The Air Accidents Investigation Branch has sent officers to the island. The search for the plane, which came down five miles west of the island's airport, involved 20 vessels and three aircraft but was hindered by fog.